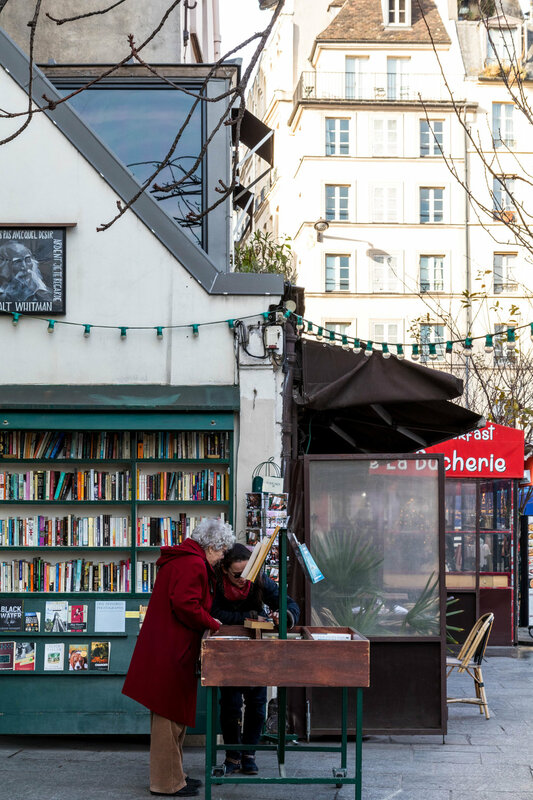 I know there is this thing with Paris in the Springtime, and, yes, traveling to the city in early December meant that we would miss out on the gardens in bloom and the warm sunshine on our faces, but there are many reasons to love Paris in the early winter. For one, the late sunrises meant that we didn't have to be up at an ungodly hour to catch that magical morning light. So on our second day in Paris, we took advantage of this with a walk through Le Jardin des Tuileries to soak up the gorgeous winter's morning. While my husband and daughter played Superman and Spiderman, I enjoyed the spectacular scenery. A friend recently asked how we manage our days while traveling with a toddler, and while we don't plan our itinerary for her, we do plan our outings with her in mind (an ever-so-slight difference, but an important one). We always ensure that there is balance to our days - for every museum or church that we stop at, we visit a garden or public square where she can run freely and get some energy out. And (selfishly), these kid-friendly stops are chosen because they have something that keeps us interested, too. 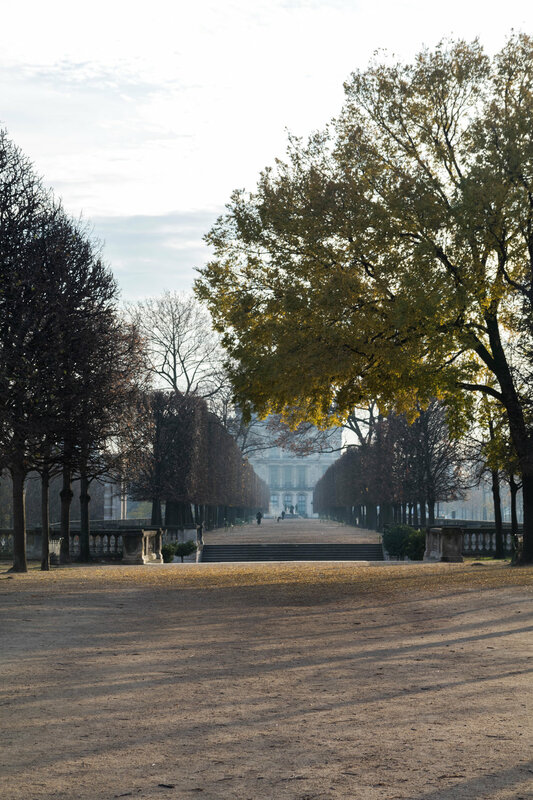 A place like the Tuileries garden easily meets these standards - a space that allows her to run around like a madwoman (or superhero) but also a space that surrounds us with so much beauty. We then set off for the Île de la Cité, with a lovely, albeit very slow, walk along the Seine. Our destination was the beautiful Place Dauphine. 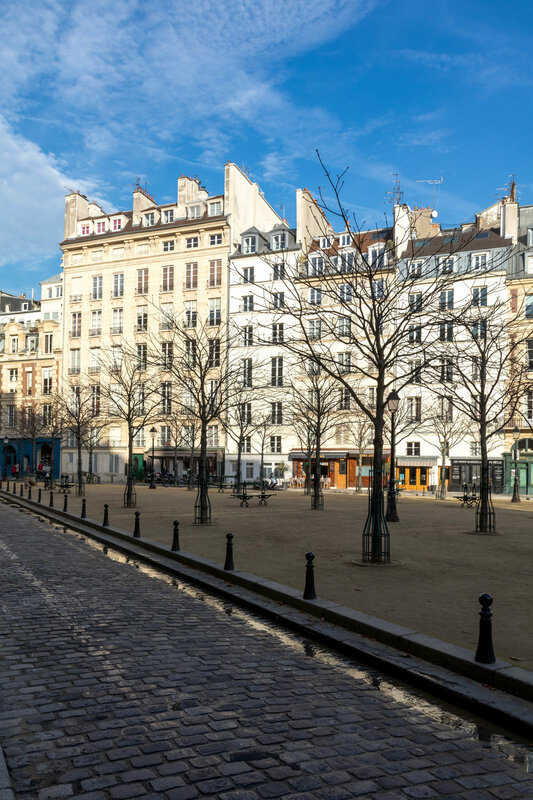 It doesn't get much prettier than this square, with its elegant facades and cobbled streets. We were starting to get hungry, so we hopped on the metro and headed to Cafe Oberkampf - a tiny cafe with food that packs a lot of punch. My husband and I both grinned when the individual pans of shakshuka were placed in front of us. My daughter ate a piece of banana bread that has a reputation for being delicious, but we wouldn't know because she wouldn't let us come near it. And the coffee? My cortado was the best cup of coffee I had in Paris. This place is an absolute gem. 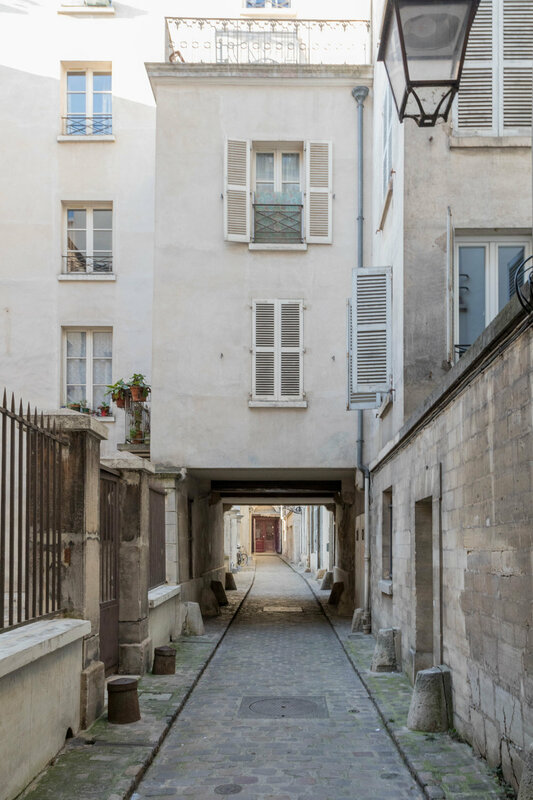 From there, we wandered down into the Marais, stopping at Merci along the way to see that instafamous car for my daughter and for me to drool over all of their homewares. (Their colored glass collection is my version of heaven, and there was a pair of houndstooth chairs that we would have really liked to take back on the EuroStar with us.) And then, on to our afternoon kid-friendly stop: La Place des Vosges, where the afternoon was warm and the light and shadows were beautiful. 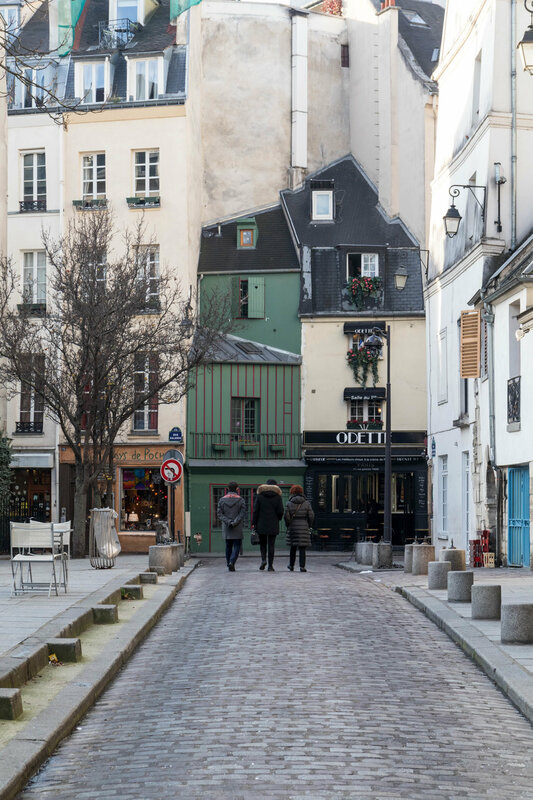 We made our way through the Marais, low on energy after a big day, but with enough gas left in us to sneak down a few alleys and capture a few more scenes of that iconic Parisian street life. A day well spent. Next up, our third and final day (plus a bonus morning photo walk through Montmartre).